The library has a copier for patron use. Copies cost $0.15 per page. 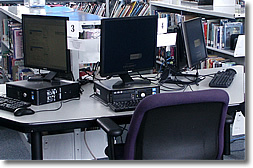 The library has 7 computers equipped with Internet access as well as Microsoft Word, Excel, PowerPoint, Publisher and Access for patron use. Please note that the computers are shut down 30 minutes before closing. Computer usage is free to any patron who has signed an Internet agreement. (Internet agreements can be picked up at the front desk.) We also offer free wireless internet service for any patron with a valid registration and a portable computer device. Wireless internet users are subject to some of the terms of the library’s internet policy, but there are no time limits for patrons using their own devices. Visitors without library cards are welcome; just ask for a guest pass at the circulation desk. The library has a printer available through the library computers for patron use. Printer use fees are $0.15 per page; only black and white laser prints available. The library does not have a public phone but will allow patrons to use the library phone on a limited basis for local calls only. There is a $0.25 fee per call. The library does NOT offer public FAX service. This service is available at both Professional Pharmacy and Redner's Warehouse Market.